Georgia's leathers are made for the person who wants the best. Georgia's leathers are specially made to fit any size and every lifestyle whether you want sporty, dressy, or both. Georgia's carries a wide range of the highest quality, buttery soft leathers made from Italian and English lamb nappa. If we don't have what you want, we'll make it for you in any size (from XS to plus) and any color. We'll even add a detachable fur collar and lining. Have problems with length or fit? Georgia will personally alter the leather of your dreams so that it will fit you perfectly. Personal style, personal fit. and personalized service, that's what Georgia's is all about. Ask about our special Internet discount. Mention that you saw one of our products on our web site and receive a special discount on our already affordable prices. Here are some pieces from our vast collection of quality leathers. Just click on the image to see a larger, more detailed view of the coat. We stand by the quality of our products, and your satisfaction is guaranteed. We carry a full line of leather jackets, available plain or fur-lined. They are also available with a fox tuxedo front. Bomber jackets: Plain, with removable fox collar, with fur lining, and reversibles. Anoraks: Plain, or with removable fox collar. 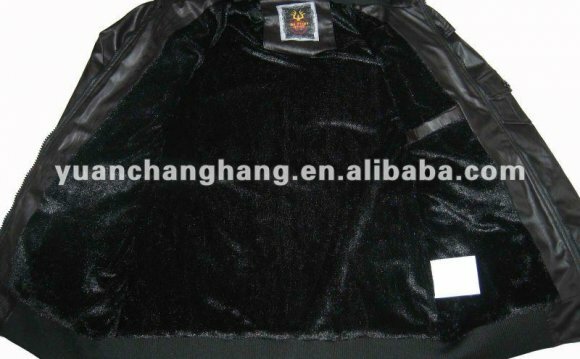 3/4 or 7/8 Leather jackets: Plain, or with removable fox collar. We also carry a full line of leather pants and skirts. We offer a full line of full-lengh leather coats in various colors and sizes. All coats can be plain or fur-lined. The coat shown is a Leather coat with belt and removable Fox collar. Brown (Cappucino) leather Anorak with Crystal Fox. Features a removable collar and drawstring on the waist. Made from buttery-soft English lamb nappa. Available from XS to L sizes. It is also available in Brown (cappuccino) leather with Brown Fox collar, and Black (onyx) leather with Black Fox collar. (Style D16).